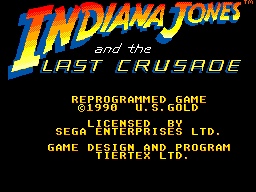 I'll start this review by stating that Indiana Jones and the Last Crusade is a special game to me; it was one of my first for the Master System and I got it as a gift from my parents. It wasn't my birthday or anything, they just came one day with a small rectangular package and gave it to me. “A book”, I thought, and proceeded to unwrap the present; my surprise was great when I was greeted by this game's nice cover (the white one). I was so happy that I never forgot it, and after so many years it moved me to choose it for review. However, for this purpose, I do it from an objective point of view. Indiana Jones and the Last Crusade follows loosely the plot of the film it is based upon, taking Indy to a quest through some of its locations in search for the ultimate treasure, the Holy Grail. What dangers await you in this adventure? Let's find out. 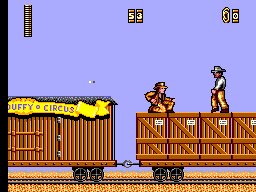 The objective of this game is simple and typical of most platformers, to reach the end of each level in a given amount of time. If the timer reaches zero, you loose a life. Enemies and booby traps stay in your way to make the road more difficult; in addition, some levels also have dead ends to confuse you and make you loose your time. On the bright side, to recover some there are sand clocks scattered through the levels. In total there are six stages; some of them are intricate, others linear, but all of them based upon locations of the movie, as it was stated above. However, while several years separate some of them in the film, in this game they are played continuously as one single adventure, without any references to the passage of time. You still get to find artifacts from the movie at the appropriate stage, though: the Cross of Coronado at the caves, the shield of Sir Richard in the catacombs, Henry Jones' diary in the German zeppelin, and finally the Holy Grail of legend. However, these objects do nothing more than increasing your score and you can just leave them behind if you want to; as far as I know this doesn't affect the game's storyline (which is already quite vague to begin with). To survive these levels, you are given 6 lives, two credits to continue, and an energy bar. Seems too much? Well, it isn't, not in this game at least. Until you get used to the game and its quirks, both lives and energy go away quickly. The fact is that, despite the presence of the life bar, Indiana is killed instantly when he comes into contact with most enemies and hazards. Then why did they put it there for, you ask? Well, it goes down when hit by enemy fire. Indiana also takes damage from falling distances higher than himself (the damage is proportionate to the height of the fall), and by hitting his head against the ceiling. Poor Indy, I though he was tougher (and smarter!) than that. In order to defeat his enemies, Indiana relies on his fists and his trademark whip. However, the latter is not a regular asset, but an item that you must pick up. Each one allows you 5 uses, and you can't have more than that at any given time. How can a whip be used up, though, is a mystery to which only the designers know the answer. While available, it replaces your punch, giving you a longer attack range. Additionally, in level four it can be used to swing from terrace to terrace. Regardless of the limited durability of the whip and the short range of Indy's punch, there are actually only three kind of enemies you can use them against, so it’s not that important. The rest are immortal or just hazards, though even those are not varied. It is worthy of mention here that aside from that, enemy placement is scarce. These enemies can be quite unpredictable, though. Not because of some advanced AI, but because they may change their behavior between games or when the player dies. The guy that shot you before may not do it at all, while the one that was passive will shoot more than usual. Some of them even don't show up! Out of the small bunch there's only one kind I'd like to remark, which are perhaps one of Indiana Jones' greatest foes in this game, even though they appear in only two levels. No, not Nazis, they don't show up here except for the cover. I'm talking about... rats. Yes, rats. These little terrors run fast across the ground and can perform a little leap once in a while; their size makes them unreachable when they move in the same platform as the player. They don't kill you instantly on contact but Indy has the bad habit of staying still for a second after being hit by them, which gives them an opportunity to continue making damage. In conclusion, rats will probably replace snakes as Indy's most feared animal from now on. To finish with the gameplay section, I will mention the last level, which adds an extra dimension to the game and introduces us to its only puzzle. The novelty is that besides from scrolling horizontally you can also move to the sides, with the level seen slightly from a ¾ perspective. The puzzle is not difficult at all and you can easily solve it by paying attention to a clue given about halfway into the path, or also by looking at the movie. Nice-looking still scenes introduce us to each level. Indiana's sprite is large, detailed, and finely animated; his movements are smooth and fluent. Most of the enemies are quite detailed as well, but their animations are much simpler. 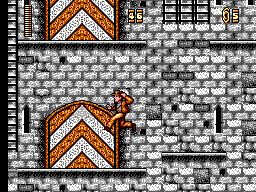 As for the environment, it easily matches the graphic quality of the sprites, and the use of more than one layer adds deepness to the side view: Indy will occasionally pass behind a wall, an archway, etc. Despite all that, many levels suffer from a severe lack of variety in color; most of the time shades of gray dominate the screen, which can get quite monotonous. The sky in the train level could have used a few clouds here and there. In the end, a more proficient use of color would have earned this game a perfect ten in terms of graphics. Music and sound effects are scarce. There are only three tunes in total: the Master System rendition of the Indiana Jones theme, and two short melodies for a level's introduction and end. They won't make your ears bleed, but they have some high-pitched notes that won't please them either. Sound effects are basic and only a few enemies and actions produce them. That, coupled with the lack of music, make playing this game a dull experience for your hearing, since the levels mostly go by in silence. On the other hand, I love the sound that the whip makes. Controls are traditional. Button 1 to attack, button 2 to jump. Left and right move your character and pressing down will make him crouch to avoid projectiles. Alternatively, on the last level up and down are used to move to the sides. The buttons respond nicely. My only complaints are about Indiana's movements: he walks a bit too slow, and once he's made a long jump there’s no way to stop, which makes falling into traps much easier. This game can be a bit frustrating at first, but once mastered it can be finished in little more than ten minutes. For that reason, it might be played when you want to play something through but don't have a lot of time. However, its ending may not be enough a reward for everybody. I also suppose it's quite possible for some to end up hating this game, to the point of not wanting to play it again, since it does have a number of shortcomings. In any case, at least I didn't after playing it to write this review. All in all, the key point about this game is that it could have benefited from a bit more of variety: variety in enemies, in sound, in levels, in music. At least, the levels could have been a bit longer. The result is a game that doesn't look quite finished, a bit empty, like a very advanced beta that gives us only an idea of how good it could be. Sadly, as it is now it just stays in the shadow of other better platformers available for your SMS. As always though, it might be best for you to try it out if you can, to reach your own conclusions. On my part, I keep cherishing this game, if only to look at its interesting cover. But I'll sure be playing it from time to time.